The SIG P210, is, to quote noted gun collector Ian Hogg, “the best pistol in the world”. Of course those of you who have forked out thousands for a heavily customised target pistol may disagree, but there is little doubt that the P210 is the highest quality pistol to ever leave a factory with the intention of equipping soldiers or police officers. The story of the P210 starts before World War 2, when a Swiss engineer, Charles Petter submitted a design on behalf of the company Société Alsacienne de Construction Mécaniques (SACM) to the French Army who were looking for a new service pistol, and this was adopted as the Mle 1935A. For some bizarre reason the French chose the calibre 7.65mm Long, more commonly known as 7.65mm MAS, rather than the 9mm Parabellum. Ballistically 7.65mm MAS is similar to 7.65mm Parabellum, though with a lower velocity. Petter based his pistol to a great extent on previous Browning designs such as the Colt Government Model. The Swiss were obviously concerned at the prospect of a German invasion, and the demand for pistols for use by the Army was high. The Swiss could not manufacture the complex 7.65mm Luger pistol (known in Switzerland as the Model 06/29) fast enough, and started looking for a simpler pistol chambered for the more effective 9mm Parabellum (although in the end the P210 was made in 7.65mm Parabellum also). Through this hole the slide stop is inserted from the frame. Unfortunately for SIG, the war ended before any decision had been made on adopting the new pistol. However, in 1947 the company received a request from the Swedish Sport Shooters Association who wanted a new pistol for target shooting. They laid down specific requirements, such as how accurate the pistol must be capable of shooting and that it must have an eight-shot magazine. This request plus interest from the Danish Army in the prototype SIG-Petter 44/8 led to SIG tooling up for production of the pistol that was initially called the SIG-Petter 47/8. This slowed down reloads tremendously and has been cursed by target shooters. The magazine disconnect safety has the double effect of also making the quality of the trigger pull worse, though over the years SIG has perfected the art of a trigger job on these pistols even with the magazine disconnect in place. After the initial sales to the Danish Army the Swiss Government finally took the plunge and adopted the pistol as the “9mm Pistole Modell 1949” or “P49” as it is sometimes called. It may seem odd issuing a pistol that was redesigned for target shooters to an Army, but the nature of the Swiss Army is that each officer is given his pistol and keeps it even after he has retired. Soldiers serve in the Swiss Army for two weeks out of the year and one of the prime aspects of this militia system is an obligatory marksmanship programme. This is a natural environment for target shooting competitions to emerge and consequently the more target shooting features a gun has the better, at least as far as the Swiss are concerned. Even to this day the P210 is very widely used in target shooting sports in Switzerland. In 1949 the nomenclature used by SIG for this pistol changed to “P210”, and the first variation of the pistol is known as the “P210-1”. The design differs slightly from the SP 47/8, the main noticeable difference being the deletion of the loaded chamber indicator which it was found occasionally caused feed jams. P210s can instantly be recognised from the earlier guns as the serial number on the gun starts with “P”. On Swiss Army pistols the serial number starts with “A”. The “-1” variation has fixed sights and usually wood grips. It was widely used by Swiss police units as well. A year later in 1950 the P210-2 was introduced, the only real difference is that this gun has plastic grips and is usually parkerized, whereas the P210-1 has wood grips and is usually blued. Later versions of the P49 Swiss Army pistol followed the pattern of the P210-2. The P210-3 is rarely referred to in most articles and is rarely seen, however it is merely the P210-1 or -2 fitted with a loaded chamber indicator. These were primarily sold to police organisations. The P210-4 was the variation sold to the German Border Police in the early 1950s. This variation is particularly sought after by collectors, and differs from the other models in that not only does it have a loaded chamber indicator, but lacks the lanyard loop in the grip and has a serial number beginning with “D”. Much rarer and very valuable are the “Cuban” P210-4s, which are in the same serial number range but lack the prefix “D” before the serial number and have the lanyard loop. The P210-5 is a target shooting version of the P210, usually it has a longer 150mm barrel that protrudes from the slide with the front sight mounted on it, and often it has the “heavy frame”, this is a thicker and stronger frame, that theoretically makes the pistol more stable when shooting due to its weight. Also it has adjustable sights. Over the years since its introduction in the early 1960s there have been a huge number of variations of it. In this picture you can also see the hammer cocked, one of the main complaints levelled against the P210 is that it suffers from “hammerbite”, i.e. when the gun is fired and the hammer is automatically cocked when the slide recoils, the spur of the hammer catches the top of your hand. Whether you suffer from it depends on the shape of your hand! One of the interesting features of the P210 is that the trigger mechanism can be removed from the gun as a unit by undoing a screw in the beavertail of the grip. The P210-6 was introduced in the early 1950s, which indicates that the numbering system was thought up after the P210-5 hit the market. The P210-7 is a .22 rimfire version of the P210, although it is usually encountered as an add-on slide and barrel for the P210-5 or -6. Obviously intended for lower cost training, although it is accurate enough for target shooting in its own right. The final version is the P210-8, which has only recently been introduced. It appears to have been intended for IPSC target shooting, although in reality an eight-shot 9mm pistol is not really competitive. It differs substantially from the earlier models in that it has a thumb magazine release, no magazine disconnect safety, and a wider safety lever and is built on a “heavy” frame. These guns sell for the equivalent of US$2,000 in Europe, but for some unknown reason the list price in the US is $4,300! Someone is making a serious profit somewhere! The gun comes with a test target showing a 3cm group at 50m. This is more accurate than most military rifles. Prior to the introduction of the P210-8 conversions of P210s by gunsmiths so that they have similar features was common. The P210 ceased to be purchased by the Swiss Army in 1975 with the introduction of the SIG-Sauer P220. The P210 was dropped simply because it was too expensive. It did continue in service for some time afterwards until older officers had retired. Note the quality of the machining and the attention to detail at the top of the grip, under the trigger guard. The bluing job is simply incredible. Many collectors get bitten by the P210 bug, and this can be fatal to your bank account! Various books have been written about them, nearly all are in German. Unfortunately in this country we are constrained by the law, and there aren’t too many people willing to cough up the cost of one of these guns when it has to be deactivated. I forked over most of the compensation money I received after the handgun ban for the P210-6 pictured here. You can get Danish Army surplus guns for a lot less but you will be looking at around £1,000 for even the cheapest P210. Less than that and you will be getting a tatty example. 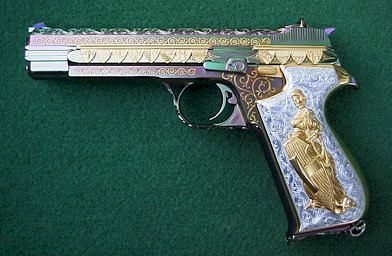 If you want one of the commemorative models, expect to be paying well into the thousands, however, on the bright side you can own it in working order as a firearm of “particular aesthetic quality”, provided you keep it at a designated site under the provisions of Section 7(3) of the Firearms (Amendment) Act 1997 and obviously you need a firearm certificate.